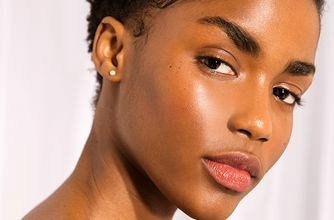 Get glowing with ICONIC London’s Prep-Set-Glow, a new – and miraculous – mist, which can be used before, after, or without make up for a gorgeously illuminated result. Refreshing and moisturising, the luscious fluid features subtle light-reflecting particles to leave you with a gorgeous gleam, whether you use it to prep skin for make up, set a finished look or to grant a stunning, ‘glossy’ effect to a bare face. The 100% vegan formula is enriched with calming cucumber and chamomile extracts to soothe any sensitivity, as well as antioxidant-rich green tea and vitamin E to condition your complexion and revitalising caffeine to wake up even the most lacklustre skin. You’ll swiftly become addicted to the radiant results. I love it, it gives my skin such an amazing glow. And the smell is gooood! Will purchase again. Love the Prep Set and Glow hydrating mist. I use it daily to hydrate, prime and finish my look. Definitely recommend for a glowy makeup finish. I have both colours of this and I think my favourite is probably 'glow' although I do like both. The spray comes out nicely, smells good and it's a really pretty addition to any look. Something to bear in mind is that it does fall down on to your body when you spray so it'll show up glittery on darker tops and/or your cleavage. I don't mind that and I actually like to spray this a lot on the body, particularly in the summer when you have exposed skin which looks really beautiful and it's so quick and easy. As far as makeup longevity goes I wouldn't say that this is the longest lasting one ever. I prefer a couple of other brands for actually setting your makeup in place. What I like to do is use a combination of a couple. So, a spritz (or 12 let's be honest) of this followed by a long lasting setting spray afterwards. Works wonders and definitely recommended. Bought this was really looking forward to it and the bottle does not squirt after numerous attempts to fix the bottle still does not work waste of money really....what a shame. I love this as a glowy hydrating primer or just as skincare as it makes your skin look so glassy, but I find the shimmers too patchy to use as a setting spray. It kinda just sprays chunks which isn't cute especially when I just spent an hour on my makeup. I'll continue to use it as a skincare finisher on no makeup days but probably won't buy again. Its a good product but the glitter goes everywhere when sprayed! Also I expected the glitter to be a bit finer. Nice to wear for a night out however! I bought this in "Original" as I'm really fair skinned. It makes your makeup look fresh and glowy, which is a good alternative for me as I can't use dewy products as I have oily skin. So instead of a sweaty mess look, it actually looks like a really nice glow. However I haven't really noticed the "set" part happen and I've used half the bottle. It's not made my makeup stay on any longer than without any setting sprays, so I'd say it's a little pricey for what it is, but that's just my opinion. Otherwise great! Love this spray for a glowy and dewy finish to my makeup, also it's amazing for spraying on your body. The smell of the mist is also lovely, however, the dispenser spray is a bit of a hit or miss and sometimes leaves patches of the product on your face. I'm also not sure on the longevity of the product as a setting mist for prolonging your makeup. Whilst this is a gorgeous looking spray I don’t think it’s worth the price tag. Pros: it’s lovely and refreshing on a hot day and smells nice. However, I don’t notice my skin is any more glossy wearing it and it doesn’t set my make up any better than my normal setting spray. It's amazing! Tried this under makeup for radiant foundation look. Looks good. Used this again after I'm done with my makeup. It made my face really glowy and nice. I love it so much! I can never go off without this anymore. It may be hard to get the spray dispersing properly at first but after a few uses, you'll be able to work it properly. As far as face mists go, it's nothing special. I have yet to see the 'glow' the product promises. All I notice is that some glitter drops set on my face. They say they have a lot of beneficial ingredients like Vitamin E, and while my skin is looking healthier these days, I'm not sure if I can credit this bottle. It is refreshing, especially on a hot day, and I've given it 3 stars because I do believe it really does hydrate your face. However, overall I would say it's over-hyped and not worth the price! It just sprays glitter on your face - and very visible bits of glitter so it does not look like a natural glow at all. I noticed that all the glitter had gone/ dropped off after a while. Also, the nozzle itself seems to spray quite a large concentrated amount of liquid in one place (unlike other facial setting sprays I’ve used) and it takes a while for the liquid to dry. As for the vitamin E and other skin care properties, I didn’t notice a difference. I won’t be using it again. Smells beautiful and leaves my skin dewy/glowy but set. Just be careful with clothes as it can leave them a little glowy also! New staple. This is the best setting spray I’ve ever used! This is ok and does hold makeup but not as well as other more reasonably priced ones. the glow is good but I finds a little OTT for work so only use it now for a night out. would purchase another less glowing for everyday look. Gives Your skin a really nice glow but have not noticed that makeup stays on longer than without it. I love this product as a makeup base, finishing spray and as a natural glow mist on bare skin with all its skin benefits! I love this spray! I bought this in 'Glow' and it certainly does just that- it gives the most amazing, subtle, sunkissed glow to my skin. It's not too glittery or sparkly but noticeable enough to give a healthy dewy look. I will 100% buy this again when this bottle runs out! I love this! It leaves your face with a healthy and dewy glow. It is worth the price and I would definitely recommend this product. I have medium skin and bought the 'glow' shade. Was really looking forward to using this and thought it'd leave my makeup finished with a subtle glow. But to be honest, the nozzle spray is so concentrated that it doesn't 'mist' your face but rather disperses product into one area so I can see visible chunks of glitter. Further, this ISNT glowy/subtlety shimmery! This is pure GLITTERY and I would've been embarrassed to walk out of the house, and this is with two sprays on my face, arm's length away. Will probably use this in the summer on my chest/legs for a glittery glow, but 100% avoid if you're looking for a setting spray. I have rather fair skin and for some reason, I ordered the darker shade, so it takes a bit of blending in but it looks lovely! The only reason I did not give it 5 stars was because when you spray it, the glitter goes EVERYWHERE. So do not spray if you are wearing white. Other than that I love it, the smell is fresh, the glow is real.